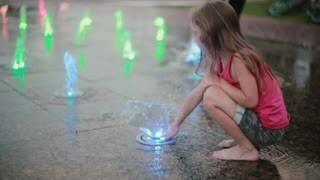 Cute little girl playing with colored water jets at the fountain in hot summer day. Wet little girl running through the water jets at the fountain and laughing. Child having fun in hot summer day. 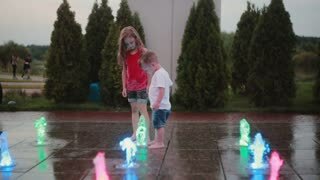 Wet little girl standing playing with water, standing on fountain jet. Happy child having fun in hot summer day. Wet little girl running through the water jets at the fountain. 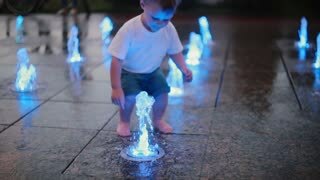 Child having fun in hot summer day, playing with water. 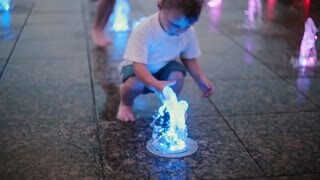 Cute little boy holding mother hand and playing with water jet at the fountain in hot summer day. Cute little girl squatting and playing with colored water jets at the fountain in hot summer day. 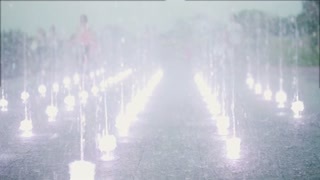 Light and water show of fountain. Children playing in water in a hot summer day, running through the water jets. 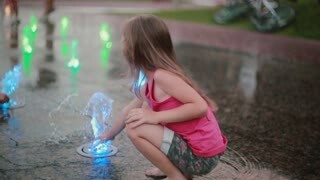 Children playing with water in park fountain. Hot summer. Happy children have fun playing in water fountains.